Elegant hotel in 15th century palazzo, situated close to the Cathedral. Arrive in Spoleto: Elegant and medieval city with important Romanesque churches and a 12th century cathedral with frescoes by Fra Filippo Lippi. Agriturismo - authentic, luxurious farm resort. Upgraded rooms for Superior route. Spoleto to Poreta: From Spoleto, follow a scenic disused railway line with long views across the Umbra Valley, then paths that climb and fall between small villages, through woodland, olive groves and farmland, to the tiny hamlet of Poreta (12 miles, 6 hours). Charming hotel in tranquil setting with spectacular views, pool. Upgraded rooms for Superior route. Arrive in hilltop Montefalco, the 'balcony of Umbria' surrounded by Sagrantino vineyards. Montefalco to Bevagna: After visiting the former church of San Francesco, with its fine frescoes by Benozzo Gozzoli and others, walk down through renowned vineyards to the little walled town of Bevagna (5.4 miles, 2.5 hours). Well-appointed hotel in a beautiful setting, with pool. Superior route has superior rooms. Poreta to San Luca: From Poreta follow small lanes and tracks to Campello Alto, a delightful medieval hill-top village, with wonderful views. Then descend to the valley passing the limpid waters of the Roman Fonti di Clitunno, and follow farm tracks and lanes across the plain to San Luca (9.9 miles, 5 hours). Stay at a fine villa surrounded by vineyards producing some of Italy's finest, though little known, red wines made from the Sagrantino grape. 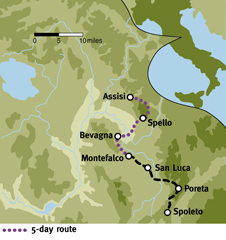 San Luca to Bevagna: Walk up through the Sagrantino vineyards to hilltop Montefalco, ‘the balcony of Umbria’. Visit the superbly frescoed Church of San Francesco before continuing on down through renowned vineyards to the little walled town of Bevagna (9.3 miles, 5 hours). Bevagna to Spello: After visiting Bevagna’s Roman theatre and impressive mosaic baths, follow small lanes and tracks across the valley to Spello where there is time to explore the attractive Roman and Medieval town (7.8 miles, 4 hours). Stunning new hotel in converted monastery in the old town; indoor pool and spa uniquely housed in its Roman foundations. Spello to Assisi: Set off early to climb the high flower-filled pastures of Monte Subasio (1,278m /4,192ft), or take a ride to near the top, enjoying fabulous views, before descending a mountain spur to enter Assisi on the stony pilgrim path once frequented by St Francis (11 miles, 6 hours). Free day to explore Assisi, or visit the nearby Franciscan sites of the Carceri hermitage or churches of San Damiano and Santa Maria degli Angeli. Strade bianche (small gravel roads), woodland paths, grassy meadows and forest paths/tracks. This fitness level for this trip is Grade 3. Good food everywhere along the route, and several very distinguished restaurants. The cuisine of the area is renowned for its delicate and subtle flavours. Game, mushrooms, asparagus, artichokes, and both black and white truffles. Superb wines of Montefalco using the unique Sagrantino grape. Try Sagrantino Passito (possibly Italy’s finest dessert wine). Wonderful contrast to Unknown Umbria & Spoleto, and for this reason makes an excellent pair to be walked consecutively. Interesting and varied with good views all the way. Accommodation: All were excellent and each a little different. Excellent locations for further exploration on tired feet. We will be back. Already looking forward to our next trip with ATG Oxford. Thank you. Plenty of fantastic places of interest, churches, museums etc. Great views and wonderful blossom, orchids and other Spring flowers. We enjoyed two days of visits in Assisi - plenty to enjoy there. Loved San Damiano for example. The whole thing was a joy and just reminded me that you only really know a place if you are on foot. Thank you to all of you. with each itinerary. In April the air is fresh, the sun warm, and there are likely to be (occasionally heavy) showers; evenings can be a bit nippy. In May things start to warm up properly. 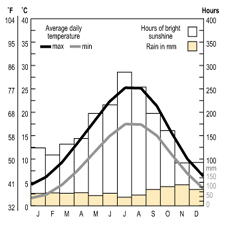 May and June are generally warm and dry, with very little humidity. Early September is still hot and mainly dry. Mid-late September offers increasingly pleasant temperatures and in October the air becomes fresher and cooler again. 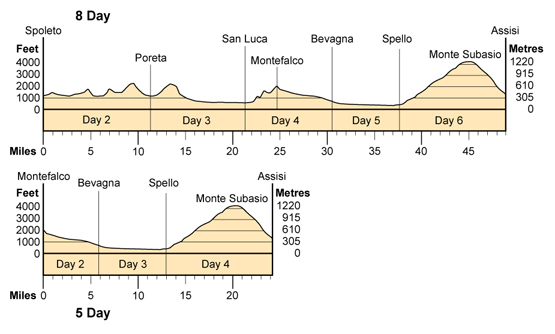 Parts of this route are quite high (particularly Monte Subasio!) and as such can be cool and windy even on a summer’s day – and cold in the earlier and later season. Please come prepared with adequate layers and waterproofs, whatever season you visit. 8-day: Walks are offered on on 5 days. 5-day: Walks are offered on 3 days. The walk lengths vary from 3.5 hours to a maximum of 6 hours. Hours of walking, which may vary from group to group, means hours of actual walking and does not include stops for lunch, sightseeing, rests or siestas. The fitness level of this walking tour is Grade 2+ - 3+ The walking generally is fairly relaxed, allowing plenty of time for sightseeing in the places en route with a free day in Assisi. However, there is a much bigger walk on Day 6 (Grade 3+), featuring some fairly steep and prolonged ascent and descent. There is an optional lower (gentler) route on that day. During the walking tour terrain is quite varied: you follow strade bianche (dirt/gravel roads), woodland and farm tracks, small grassy and stony paths and walk in open meadows. The recommended airports for this route are Rome (Fiumicino/Ciampino) and Perugia. A useful website: www.rometoolkit.com, then click the airports link. There is a very limited bus service from Rome to Spoleto, so we recommend that you take a train from Roma Termini. Spoleto is on the main train line from Terni to Perugia. You can buy your ticket at Termini station to board the regional train for ANCONA and get off in Spoleto. The distance is about 125 km, and the train ride will take less than 2 hours and costs approximately €9. Trains run approximately every hour check www.trenitalia.it for times and to book your ticket online. For trains at peak times or express trains it is advisable to book in advance. Important! Do not alight at 'Baiano di Spoleto', which is a smaller station you will pass through 6km (approx 8 mins) before arriving at Spoleto. Roma Tiburtina is the second-largest railway station in Rome, after Roma Termini. You can also catch a train from here to Spoleto (€8.10). There can be long queues at Tiburtina station so it is best to allow plenty of time. Please remember to validate any train ticket you purchase in Italy before you board the train by stamping it in the yellow machine at the entrance to the platform; your ticket is not valid for travel unless you do this and you can be fined if you fail to do so. From Fiumicino airport take the Leonardo Express shuttle train that runs from the airport to Roma Termini station in Rome’s city centre. You can buy your ticket at the airport (runs every 30 minutes between 06.00-23.30; €14 one way). Ciampino to Roma Termini: There are shuttle buses to Roma Termini operated by Terravision (www.terravision.eu) – pink/grey buses - and SIT (www.sitbusshuttle.com) – blue/silver buses. Both work fine! If you buy your ticket on line it will cost €8 return, slightly more if you buy on the bus or at the airport/ station. Buses leave regularly from outside the departures terminal, journey time 40 minutes. From Perugia airport, you can take a bus (although please note the bus service is linked to flight arrivals and buses are not frequent) or taxi (€40) to Perugia central train station (also called Perugia Fontivegge). From there, take a train to Spoleto (1 -1.5 hrs; €5-€8) – noting that you may have to change trains at Foligno. NB: many trains leaving Perugia central station also stop at Perugia Ponte San Giovanni, an outlying station that is slightly closer to the airport. If you do find you are obliged to take a taxi from the airport, you can travel direct to Perugia Ponte San Giovanni station (approx. €25) and catch an onward train to Foligno/Spoleto there. From Rome: We can book you a taxi from either of the Rome airports to the first hotel in Spoleto. The taxi holds 3-4 passengers (depending on luggage) and costs €200 (journey time 2 hrs). Parties of 5 or more can hire a taxi-minivan which costs €250. From Perugia: We can book you a taxi from Perugia airport to the first hotel in Spoleto, which costs €80 (or €110 for a larger minivan-taxi). Please be aware that taxi prices may be higher at weekends, Bank Holidays or late at night. · If you change your flight please notify us on 01865 315678 so we can contact the taxi company to reschedule the taxi for you. · If, on the day of departure, your flight is cancelled or you miss or change it, please immediately contact the ATG emergency number 01865 315600 so we can contact the taxi company to reschedule or cancel the taxi for you. · If your flight is delayed and you have arranged for the taxi to meet you at the destination airport, your taxi driver will wait for you. · If you are delayed and you have arranged for a taxi to meet you at a non airport location (e.g. train station) it is essential that you contact your Route Manager or call the ATG emergency line to notify us at the earliest possible moment, so we can contact the taxi company to re-schedule or cancel the taxi for you. · Please note that failure to advise ATG that you cannot meet the taxi booked for you may result in the taxi costs being passed back to you. Important: Taxi prices quoted apply to the local firm used regularly by ATG. If you prefer, you may also contact our regular taxi driver directly to make your ownarrangements: his name is Carlo Buffatello - email info@shuttleperugia.it - or telephone: +39 347 9107977. If you get a taxi off a taxi rank please ask the driver to confirm the price for the journey before departing. Spoleto train station is in the modern part of town, below the historic centre. It's a fairly long walk uphill into the old centre so perhaps a good idea to take one of the ‘Umbriamobilità’ / BusItalia* town buses (often a minibus), which run from outside the station headed towards Posterna (double check with the driver) and change onto another bus to get to the centre. Hotel Charleston: You will need to get off the bus at Piazza Collicola. The hotel is at number 10. Palazzo Dragoni: You will need to get off the bus at Piazza Mentana (P.zza Pianciani) Ask the driver to alert you when you are here. For Hotel Dragoni walk down Via Walter Tobagi, continue straight ahead (not following the road bending RHS downhill) along Via del Duomo. Palazzo Dragoni is on the LHS (pink-orange building). Alternatively, you may prefer to take a taxi to either hotel – the cost is about €15 for the 3 km trip to the old centre above. Taxis are not always easy to come by, however, as there are only 3 licensed taxis in Spoleto. Please ask the office for the contact number of the route manager. They will be pleased to organise a taxi once you know your arrival time in Spoleto. Hotel Aurora can offer a secure parking space at about 150m from the hotel for €3 a day. Please ask the hotel reception for a pass. Palazzo Dragoni does not have a private car park. For clients staying there, the hotel can arrange a parking permit valid for the entire length of their stay. With that clients can park just outside the hotel. Alternatively, there are a number of public parking lots outside the centre of Assisi, which charge €11 per 24 hrs. To travel between Assisi and Spoleto the best option is the train, as buses are few and far between. Note, however, that in each case the train station lies some distance from the centre of town. If you are leaving the car in Spoleto, your Route Manager can help you source information about the return journey. Umbrian cuisine dates back to Etruscan times, and since then each town has developed its own take on the area’s intense flavours and rich dishes centred around fabulous, fresh vegetables, delicious olive oils, a variety of grains and pulses, and high-quality meats. Truffles are of course the most famous Umbrian speciality, and whilst you might not be able to find a freshly dug one, you will always be able to find a canned or bottled version. They are used sparingly in such things as omelettes or specialities like crostini al tartufo, small croutons with a truffle paste. Meat and game features quite largely on the menu with porchetta, a variation on roast pork stuffed with herbs and spices. Look out too for the extraordinary salame mazzafegato, a salami of pine nuts, pork liver, candied orange, sugar and raisins. Palombaccia, or wild pigeon roasted and then cooked in a sauce of wine, oil vinegar and herbs. Other variations include piccione alla Perugia, pigeon roasted with black olives. Inevitably pasta features heavily. Look out for the large heavy pasta cooked in a sauce of garlic, tomatoes and cheese, together with various spaghetti dishes with truffle sauces. rather like a Vin Santo crossed with blackberry! There is no need to dress up for dinner – ‘smart casual’ dress is acceptable in all but the smartest restaurants in Italy. If you decide to treat yourself to a special restaurant, men may wish to wear a jacket and women a dress or skirt. All have WIFI and hair dryers; some offer laundry service. The recommended airports for this tour are Perugia and Rome (Fiumicino and Ciampino). There are regular trains and buses to Spoleto from central Rome (1.5-2 hours, €9) and from Perugia (1 hour, €5-€8). There are trains to Foligno from Rome (1.5- 2.5 hrs, €10) and from Perugia (40 minutes, €4), then bus or taxi to Montefalco. Taxi costs: From Rome to first hotel: €200-€220; from Perugia to first hotel: €80-€90; from Foligno to Montefalco: €40. Prices may be significantly higher on Sundays and public holidays. Taxis can be booked via the ATG office. For more detailed information on reaching the route, see Frequently Asked Questions.